We at Uplift Sports Ministry would like to take a moment to thank everyone who has ever been a part of our training ministry family. It is hard to believe that we are quickly approaching the two-year anniversary of our opening. It is impossible to put into words how awesome it has been watching these young athletes grow physically and mentally, but the most satisfying has been watching them grow spiritually. It always brings joy hearing about the athletic success achieved on the playing fields and courts but nothing compares to hearing a parent tell how much their child enjoys the bible studies and the conversations that arise from them. Since our opening we have had many young athletes come to know the Lord for the first time and many more get to know Him even better. We have also had the humbling opportunity to baptize six new believers right here at USM. We know there is no shortage of training facilities in the area and we want you to know that we greatly appreciate your support for this ministry. It has always been our goal at Uplift Sports Ministry to keep our prices as low as possible in order to reach as many young athletes with the Gospel as possible. However, there are still many of these athletes that are in situations that do not allow them this opportunity. We have just recently received final approval for our 501C3 status, which allows us to accept charitable donations. Those donations will help scholarship athletes in less fortunate situations. 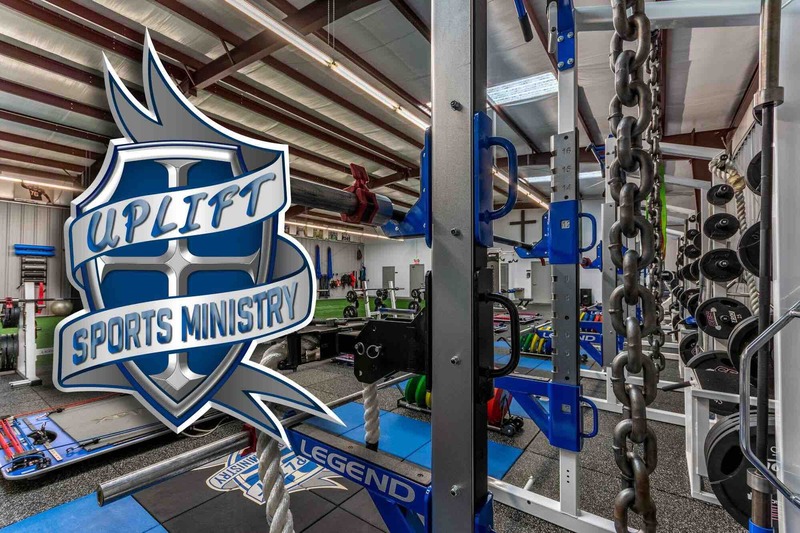 Uplift Sports Ministry is committed to the physical, spiritual, and moral development of athletes through sports performance training by combining the highest level of sports specific training with sound biblical teachings and character building opportunities. Uplift Sports Ministry is a sports performance training company that is immersed in both spiritual and character development. USM integrates over 25 years of elite level athletic sports performance training experience with local churches, faith-based sports ministries (FCA), and character development ministries (NG3). Uplift Sports uses a unique blend of performance weight training with emphasis on both strength and power development combined with sports specific, position specific, and movement specific training using a wide variety of specialized training equipment designed to enhance specifically targeted areas of an athlete’s movements. Founder, Robby Stewart, has been an elite level sports performance coach for over 25 years and is recognized as one of the foremost sports performance coaches in the United States. He has assisted in the performance development of over 1,200 professional athletes across the NFL, MLB, NBA, and MLS, as well as Olympians from 9 different countries. Robby also spent time working with the Swedish National Federation Olympic Weightlifting Team prior to the 1996 Olympic Games in Atlanta. Baseball athletes include: Jeff Francoeur (Atlanta Braves), Tim Beckham (TB Rays), Matt Carpenter (St. Louis Cardinals), and Marwin Gonzales (Houston Astros). Robby has also trained athletes that have collectively won every major collegiate football award including the Heisman, Outland, Nagurski, and Unitas Trophies. His football athletes include more than fifty All-Americans, over forty Pro-Bowlers, one NFL Comeback Player of the Year, two Defensive Rookies of the Year, and the 2009 NFL Defensive Player of the Year, as well as recipients of the Walter Payton NFL Man of the Year Award. The training facility at UpLift Sports Ministry has been designed with the sole intention of providing our athletes with every tool necessary to fulfill his or her training goals. UpLift Sports is a product of over three decades of training experience in elite level training facilities as both a player and coach. Complete with locker rooms, meeting rooms, and a conference room, UpLift Sports Ministry will meet all athletic needs.